Fans are encouraged to plan how they will travel to and from Anfield this season as Liverpool get ready to kick off their 2017-18 Premier League and Champions League campaigns at home. Liverpool FC, Merseytravel and local transport operators are continuing to work together to help make matchday travel more convenient for supporters heading to the stadium. The club is encouraging fans to use public transport to travel on a matchday, which is the easiest and most efficient way to reach the game. There will be no additional parking available in the local area. Here is an outline of the quickest and most convenient ways to travel to Anfield this season. Fans can catch the 917 express bus service, which will run direct from Liverpool city centre to Anfield every 10 minutes. The LFC Fan Support team will also be on hand to assist supporters using buses departing straight after the game. There is a discounted ticket price of £4 on the 917 express bus service, with fans receiving a discount on soft drinks at LFC kiosks within the stadium on presentation of their return ticket. From Liverpool city centre, fans can also take the 26 or 27 from Liverpool ONE bus station or 17 from Queen Square bus station directly to the ground. The 68/168, which operates between Bootle and Aigburth, and the 14 and 19 (from Queen Square) stop a short walk away from the ground. The 501 football service is also available and operates direct to Lime Street Station (Skelhorne Street) from Walton Lane for up to two hours after the final whistle. Adult fares are £2, children £1. Please note this service only operates post-match. Lime Street Railway Station is two miles from Anfield. Fans can take a taxi from Lime Street (fares usually cost between £7- £9) or buses go from nearby Queen Square bus station. On matchdays, fans can also use the Merseyrail network to link with the Soccerbus service from Sandhills station, which operates direct to the stadium. Taxi pick-up points are available outside of the stadium and on major routes, making it easier to get home after the final whistle. Taxi One operates a taxibus service from St Johns Lane, Liverpool city centre direct to Anfield. A frequent service operates from three hours prior to kick-off. Taxi One return service operates from the corner of Anfield Road/Sleepers Hill opposite the Isla Gladstone conservatory back to the city centre. 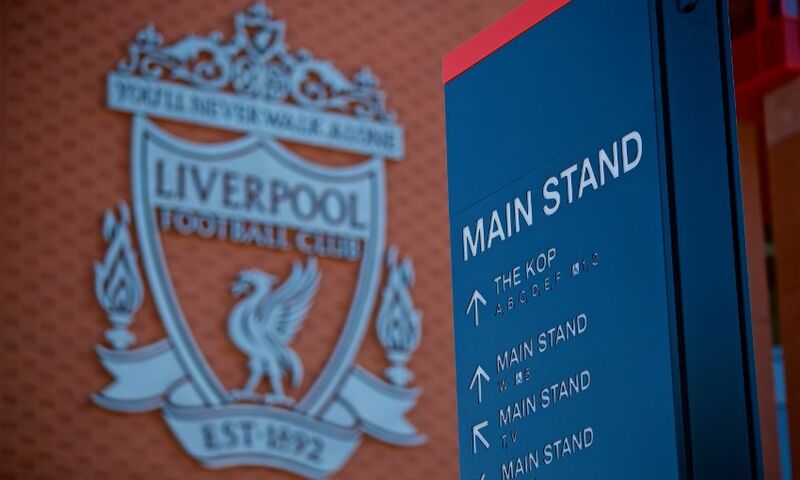 Walking routes are signposted from Liverpool Lime Street and nearby Sandhills and Kirkdale stations to assist fans who travel to the game using local rail services. The free LFC Cycle Hub will return to Stanley Park for the 2017-18 season. The hub allows fans who cycle to the game to park their bike safely and securely with an attendant. Fans are also encouraged to avoid the crowds and get to Anfield early to enjoy the Fan Zones, which are located in Paisley Square and Anfield Road. They are open four hours before kick-off and are ideal for supporters to meet before the game and soak up Anfield’s unique atmosphere. 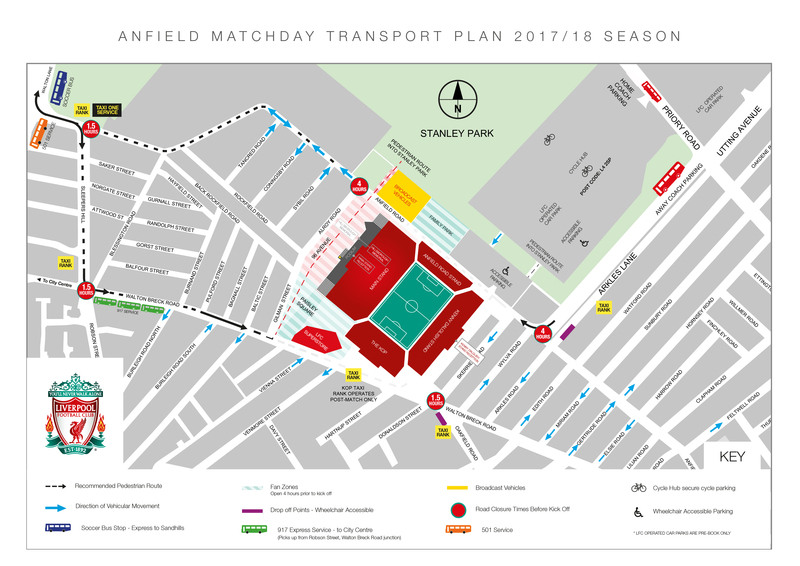 For more advice on travelling to Anfield, please visit www.liverpoolfc.com/gettingtoanfield, or check out our transport map below (click to enlarge).